Photos courtesy GCHS The Trebein-Flynn home is an elegant part of the Greene County Ohio Historical Society complex. On Oct. 20, 1965, the Galloway log house was moved from the corner of South Monroe and East Second to West Church Street. In February 1929, about 100 Greene County residents met at the Greene County District Library to organize a historical society. Dr. William Albert Galloway presided over the meeting, partly because he was in charge of the historical exhibit for the 1928 Home-Coming Committee. He spoke briefly of highlights in Greene County history, and of the danger of losing such a wealth of personal and general history unless it were collected by organized effort. Following that initial meeting, the group met bimonthly in various places, including the courthouse and Shawnee Park. Speakers presented lectures, further plans were made to preserve county history, and schools were encouraged to include the history of Greene County in curriculum materials. In 1934, Miss Emma King donated a house and lot at the corner of Second and Monroe Streets in Xenia to the county commissioners for a museum. In response to this generosity, the Greene County Museum Association was organized in April of that year. In 1936, arrangements were made to move the Galloway log house from its original location near Goes Station to that lot. During the next few years, the group learned about museum management firsthand; collecting and caring for artifacts and building maintenance were all part of having a permanent home. Memberships were solicited to further the work of the society; the county commissioners agreed to fund the museum’s running expenses in 1935 “as the building had been given to the County for museum programs.” The Greene County Museum Association and Greene County Historical Society merged in 1953, the year of Ohio and Greene County’s 150th birthday celebrations. In time, the members felt that additional property would be desirable, and through the donations of two men, Charles Snediker of Fairborn and John Glossinger of New York via Xenia, the property on West Church Street was acquired. The William G. Moorehead house on the corner of North Detroit and West Church held many artifacts. The Snediker Museum, named after its donor, was a brick carriage house on the Moorehead property and housed pioneer tools and implements. The John Glossinger Cultural Center was used for meetings and contained the offices of the society. In 1965, the Galloway log house was removed to this location from its former home at Second and Monroe Street, and the four-building complex was complete. Things went as usual until the afternoon of April 3, 1974. Of the four historical society buildings, three were damaged beyond repair, with the log house the only survivor. It received a temporary roof while artifacts and fixtures were gathered and stored by volunteers until the society could find suitable storage during the rebuilding process. Storage facilities ranged from an old warehouse in Yellow Springs, to Hooven & Allison property, to members’ homes. There was no question about rebuilding; many different options were considered. 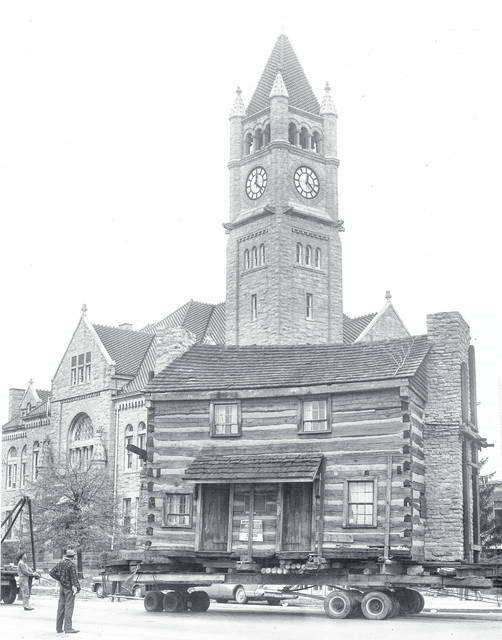 After much thought, the membership voted to “trade” the city of Xenia a portion of the property which was needed for widening Church Street, in order to purchase a house to replace the Moorehead & Glossinger houses, and to rebuild the Galloway log house at its same location. A grant was obtained for restoration of the log house, which became the primary, immediate goal. During this time, membership meetings were held in various places throughout the county, but none were missed. The log house was reopened to the public in December 1975. 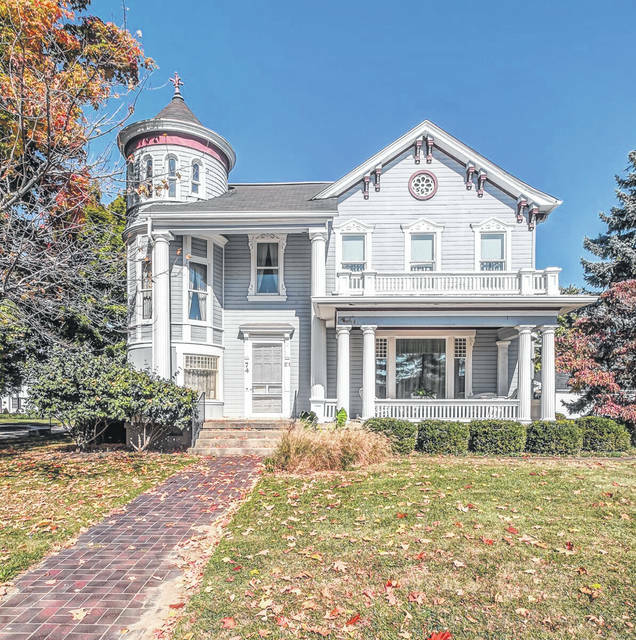 The Queen Anne house from the southeast corner of Church and Detroit was moved to the corner of southwest Church and King in 1977; The Paul Gertler Co. of Reynoldsburg did the moving, which took two days and cost around $15,000. In 1990, with donations and help from many, the Brantley Carriage House Museum, a three-story brick building modeled after the old Snediker carriage house, was erected behind the Town House. Presiding over the dedication ceremony was Dr. Norman Vincent Peale, formerly of Bowersville. In fall 2009, the Galloway log house was restored at a cost of nearly $30,000, replacing rotted logs and the cement chinking from the 1974 rebuilding, and adding copper gutters and downspouts. The Historical Society continues to preserve historical artifacts and documents in its three-building complex on West Church Street, as well as its caboose on South Detroit Street, which are open to county residents and visitors alike. Monthly meetings on a variety of topics welcome those who wish to attend, and annual memberships at a minimal cost are available for all age groups. Commemorative N and HO scale railroad cars with the 90th anniversary logo will be available also, at a cost of $25 each, to raise funds. For further information about the Greene County Ohio Historical Society or its programs, contact us at 937-372-4606 or gchsxo@yahoo.com. https://www.xeniagazette.com/wp-content/uploads/sites/32/2019/02/web1_Town-Hse-Front-2.jpgPhotos courtesy GCHS The Trebein-Flynn home is an elegant part of the Greene County Ohio Historical Society complex. https://www.xeniagazette.com/wp-content/uploads/sites/32/2019/02/web1_log-house-move-20-Oct-1965.jpgOn Oct. 20, 1965, the Galloway log house was moved from the corner of South Monroe and East Second to West Church Street. Catherine Wilson is executive director of the Greene County Ohio Historical Society.